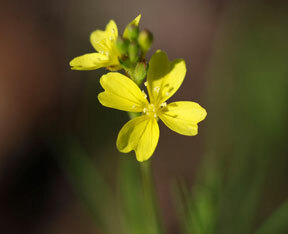 Also Called: Narrow-leaved evening primrose. Stems: Erect, slender, simple or branched above,sparsely coarse-hairy when young, nearly smooth to inflorescence; branches ascending. Leaves: Basal leaves egg-shaped or narrowly elliptic, .4 to 1.6 inches long, 1/12 to 1/4 inch wide, smooth to sparsely pubescent, margins entire to remotely toothed, base narrowed to a winged stalk, usually absent at flowering; stem leaves alternate, numerous, ascending, linear, thread-like, .4 to 1.6 inches long, less than 1/25 inch wide, smooth to sparsely pubescent, nearly sessile, sometimes with clusters of leaves in leaf axils. Inflorescences: Spike, unbranched, .5 to 4.8 inches long, stiff- to glandular-hairy, terminal. Flowers: Mature buds erect; bracts egg-shaped to triangular, less than 1/12 inch long; sepals 4, ovate-lanceolate, less than 1/12 inch long, less than 1/50 inch wide; petals 4, yellow, heart-shaped, 1/8 to 1/5 inch long, often prominently notched; stamens 8, filaments short; stigma deeply 4-lobed. Fruits: Capsule, oval-rhombic, 4-ridged, 1/6 to 1/3 inch long, minutely pubescent, sessile or short-stalked; seeds tiny, reddish-brown, smooth to minutely bumpy, in several indistinct rows in each compartment. Habitat: Rocky ledges, sandy prairies, rocky or sandy open woods, waste areas, pastures, and fallow fields; sandstone, chert or granite; acidic soils. Comments: Flowers open near sunset and remain open through the following morning.